Maldita Nerea, one of the most loving and important bands in Spain, will be heading the coming Vodafone yu Music Shows, taking place in Barcelona and Madrid. Concerts are taking place on May 7 at classic Barcelona's room, Razzmatazz, and May 9 at La Riviera, Madrid. Coming also from Murcia, the band winner of the last edition of Vodafone Yu Music Talent, AYOHO, will be the guest band in both shows, where they'll present their first album: "Deference & Wonder". Besides, a group of Vodafone customers and their friends will have the chance of getting to personally the members of Maldita Nerea. Vodafone yo Music Shows are still offering the best bands and artists either national or international. Artists like Izal, Crystal Fighters, Leiva, Melendi, Belako have already become part of the Vodafone music history, and now is the turn for Maldita Nerea. 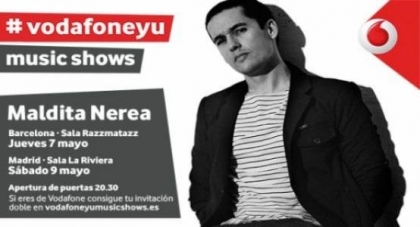 If you are Vodafone client and you want to get your invitation to the concert, go to www.vodafoneyumusicshows.es and register with your telephone number. Every ticket will be double, so the winner of the invitation can go with a friend to it. Also, 10 Vodafone customers and their friends will have the chance to know Maldita Nerea and get a personal signed poster before the show, in a exclusive meeting with the band.